I’ve written a couple of guest posts for Nieman Journalism Lab and the tech news site Memeburn. The Nieman post is part of a series looking forward to 2012. 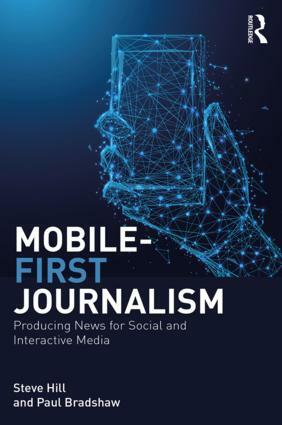 I’m never a fan of futurology so I’ve cheated a little and talked about developments already in progress: new interface conventions in news websites; the rise of collaboration; and the skilling up of journalists in data. “But the power of the former audience is a power that needs to be held to account too, and the rise of liveblogging is teaching reporters how to do that: reacting not just to events on the ground, but the reporting of those events by the people taking part: demonstrators and police, parents and politicians all publishing their own version of events — leaving journalists to go beyond documenting what is happening, and instead confirming or debunking the rumours surrounding that. “So the role of journalist is moving away from that of gatekeeper and — as Axel Bruns argues — towards that of gatewatcher: amplifying the voices that need to be heard, factchecking the MPs whose blogs are 70% fiction or the Facebook users scaremongering about paedophiles. This entry was posted in data journalism and tagged 2012, axel bruns, Charles Arthur, eric s raymond, fourth estate, freedom of information, futurology, gatekeeping, gatewatching, heather brooke, memeburn, nieman journalism lab on December 29, 2011 by Paul Bradshaw. A long, long time ago, I tinkered with a hack called Serendipitwitterous (long since rotted, I suspect), that would look through a Twitter stream (personal feed, or hashtagged tweets), use the Yahoo term extraction service to try to identify concepts or key words/phrases in each tweet, and then use these as a search term on Slideshare, Youtube and so on to find content that may or may not be loosely related to each tweet. [The Y! COntent Analysis service will] extract key terms from the content, and, more importantly, rank them based on their overall importance to the content. 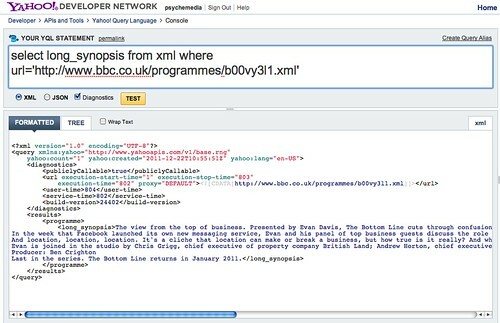 The output you receive contains the keywords and their ranks along with other actionable metadata. On top of entity extraction and ranking, developers need to know whether key terms correspond to objects with existing rich metadata. Having this entity/object connection allows for the creation of highly engaging user experiences. The Y! 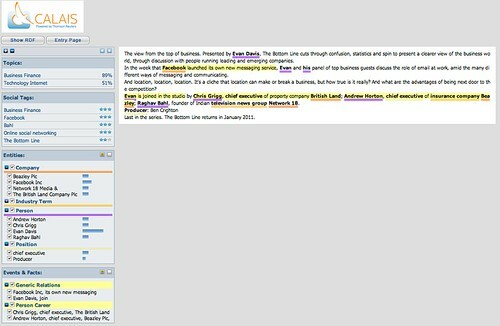 Content Analysis output provides related Wikipedia IDs for key terms when they can be confidently identified. 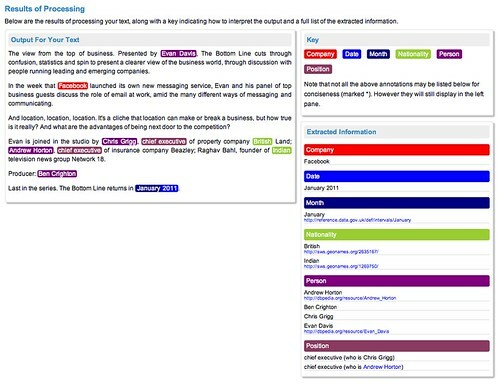 This enables interoperability with linked data on the semantic Web. The view from the top of business. Presented by Evan Davis, The Bottom Line cuts through confusion, statistics and spin to present a clearer view of the business world, through discussion with people running leading and emerging companies. In the week that Facebook launched its own new messaging service, Evan and his panel of top business guests discuss the role of email at work, amid the many different ways of messaging and communicating. And location, location, location. It’s a cliche that location can make or break a business, but how true is it really? And what are the advantages of being next door to the competition? Evan is joined in the studio by Chris Grigg, chief executive of property company British Land; Andrew Horton, chief executive of insurance company Beazley; Raghav Bahl, founder of Indian television news group Network 18. Last in the series. The Bottom Line returns in January 2011.
select * from contentanalysis.analyze where text="Italian sculptors and painters of the renaissance favored the Virgin Mary for inspiration"
So, some success in pulling out person names, and limited success on company names. The subject categories look reasonably appropriate too. Another related service in this area that I haven’t really explored yet is TSO’s Data Enrichment Service (API). Pretty good… and links in to dbpedia (better for machine readability) compared to the Wikipedia links that the Yahoo service offers. The best of the bunch on this sample of one, I think, albeit admittedly in the domain the Reuters focus on? But so what…? What are these services good for? Automatic metadata generation/extraction is one thing, as I’ve demonstrated in Visualising OU Academic Participation with the BBC’s “In Our Time”, where I generated a quick visualisation that showed the sorts of topics that OU academics had talked about as guests on Melvyn Bragg’s In Our Time, along with the topics that other universities had been engaged with on that programme. This entry was posted in online journalism and tagged onlinejournalismblog, Tinkering on December 22, 2011 by Paul Bradshaw. I have a confession: I have never liked student projects aimed at students. They tend to betray a lazy approach to creativity: after all, what can be less imaginative than a project aimed at ‘people like me’? 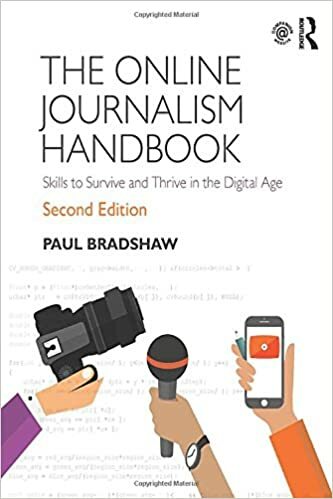 They also don’t generally develop the skills that journalism degrees aim for: original research, for example; flexibility in style; or an exploration of professional context. But I think my instinctive aversion has been wrong. I think it’s as lazy as the ideas I’ve criticised. And I think it means missing an enormous opportunity. Traditionally, one of the biggest strengths of the regional journalist was their connection to the communities they reported on. They knew the issues; they knew who to speak to in those communities (and not just who published the press releases); they knew their readers; and they saw the impact of their work. University students, in contrast, are perhaps at a stage in their life when they are least connected to any community. They are often living in a town or city they have no history in; they are unlikely to run businesses, or belong to any industrial or professional culture; few have children in the local education and health systems. They are inbetweeners. It is possibly the worst time in somebody’s life to expect them to do journalism. And the one thing that they are connected to – student life – we steer them away from. So I have a New Year’s resolution for 2012: I’m going to change the habit that I’ve acquired from a decade in teaching journalism. For the first time I am going to assign my students – just one group – a project focused on students. It will still build those essential skills: original research; flexibility of style; professional context. But those skills will be built upon a knowledge that what they will be doing will have a large audience, and can make a real difference to them. That means that I will be expecting more. Because they already know the community they are writing about, I will be expecting them to hit the ground running with original leads and story ideas – not trying to hit a story quota with press releases or superficial he-said-she-said conflicts. Because the project will be online-only, I will be expecting them to be exploring new ways of engaging – and collaborating – with the most connected audiences in the country. And because they are personally affected by the systems they are reporting on – from employment law and tenants’ rights to student councils and representation – I will be expecting them to research the system itself: where power and accountability lies; where the money goes, and why. As a result, I’m hoping that students will develop an understanding of how to investigate systems in any field – transferring their experiences of investigating education into investigating the health system, welfare system, local government, or anything else. I’ll be using Help Me Investigate Education as a space to help them build that knowledge, and those connections, and to collaborate with journalism students and others across the UK. If you have a class that you want to get involved, I’d be happy to help. And there are plenty of stories to be told. Like any transient population, students are subject to many abuses of power. In 2012 I want to see if, given the opportunity, student journalists can hold that power to account. This entry was posted in blogging and tagged Education, help me investigate, new year's resolution, student journalism on December 16, 2011 by Paul Bradshaw.